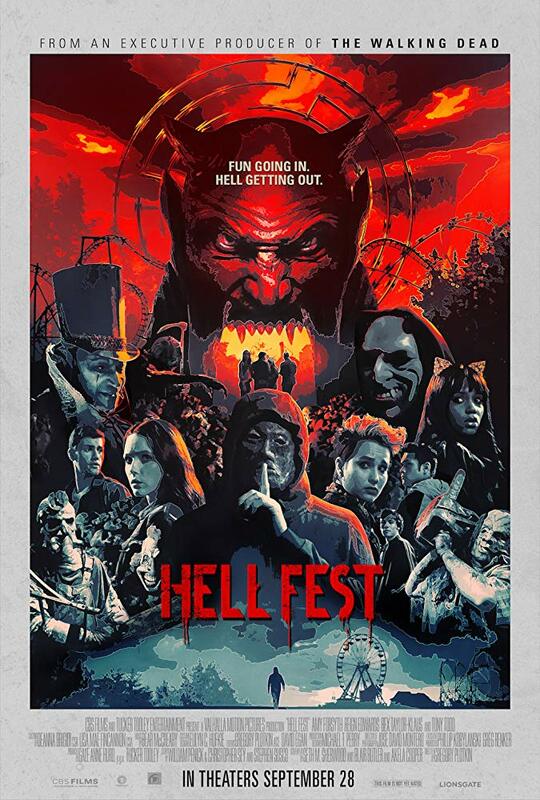 The biggest shock incurred by watching HELL FEST is the credit for six writers: we presume that one was in charge of working through the “Horror Movie By Numbers” craft kit while the other five spent half an hour typing up the script in between making the drinks. The core scenario is fun, however - speculating about how easy it could be to stage a murder spree at a haunted house attraction, ensuring your gruesome handiwork is mistaken for props by a crowd looking to be scared. It centres around one such travelling horror carnival – dominated by a walk-through maze that hits the beats of popular 2018 horror, which means yet more demon nuns and creepy clowns. 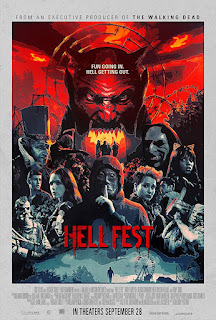 Several scarers at the “Hell Fest” have the same outfit and mask as the real killer, while the one-dimensional heroine fulfils the usual duties of striving to convince her sceptical friends of the threat. Director Plotkin has experience with the most flamboyant and funhouse-like of the PARANORMAL ACTIVITY films (THE GHOST DIMENSION) and enjoys simulating an elaborate, colourful modern horror attraction. He also stages the horror sequences with a degree of gleefully gruesome flair: a marvellously nasty head-smash and a graphic close-up Fulci-inspired eyeball stabbing are the highlights. Tobe Hooper’s THE FUNHOUSE explored the same territory with more wit and character, and Tony Todd (in a single scene as the Barker) is wasted yet again, but Bear McCreary’s score is characteristically effective, and it bows out with the one genuinely unsettling scene in the whole movie.